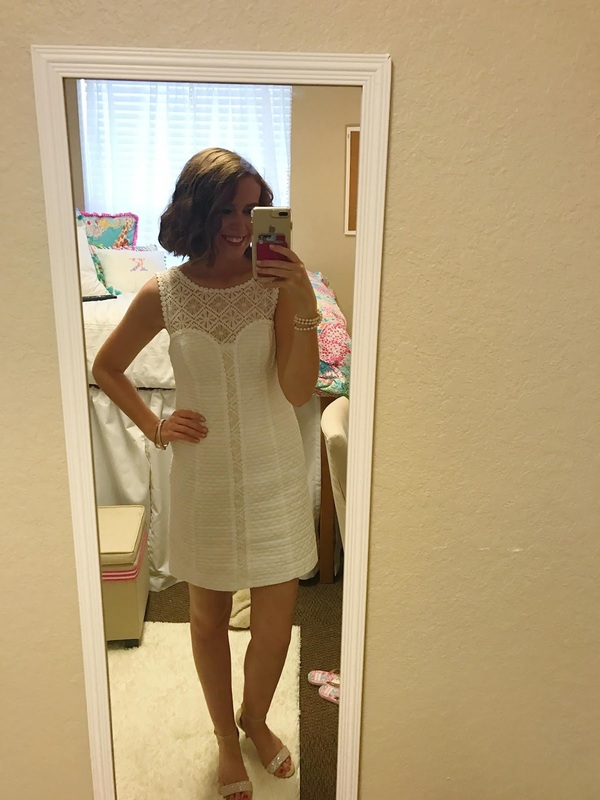 A few weeks ago on my Instagram Stories, I asked what posts you'd like to read and I received requests to share what I wore for sorority recruitment. 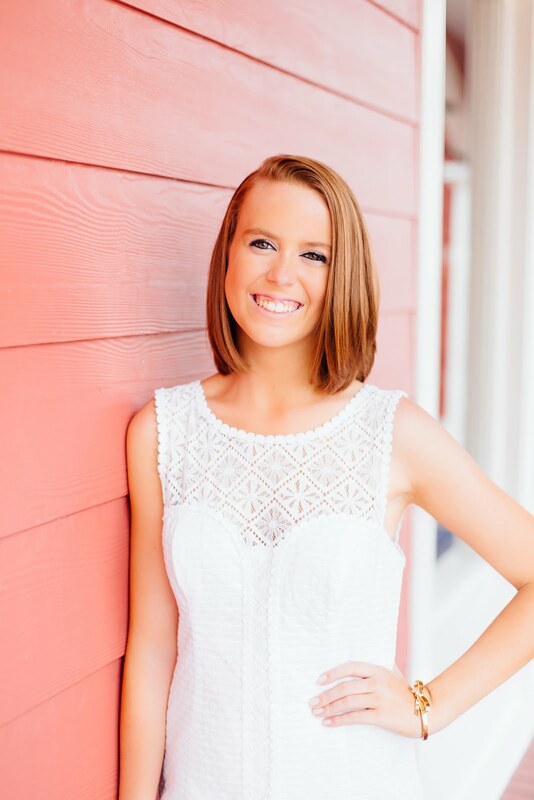 I was hesitant to share about my recruitment experience in any aspect because everyone has their own experience, and I did not want any of my potential posts to come across like I am some sort of recruitment coach and think you should act or dress a certain way. You should be you in all ways, shapes, and forms! But I do think seeing how people interpret outfit suggestions can be helpful, so I decided to share my outfits in case you may be feeling uninspired in approaching your own look. I am writing this post to share, but not suggest what you should specifically wear. 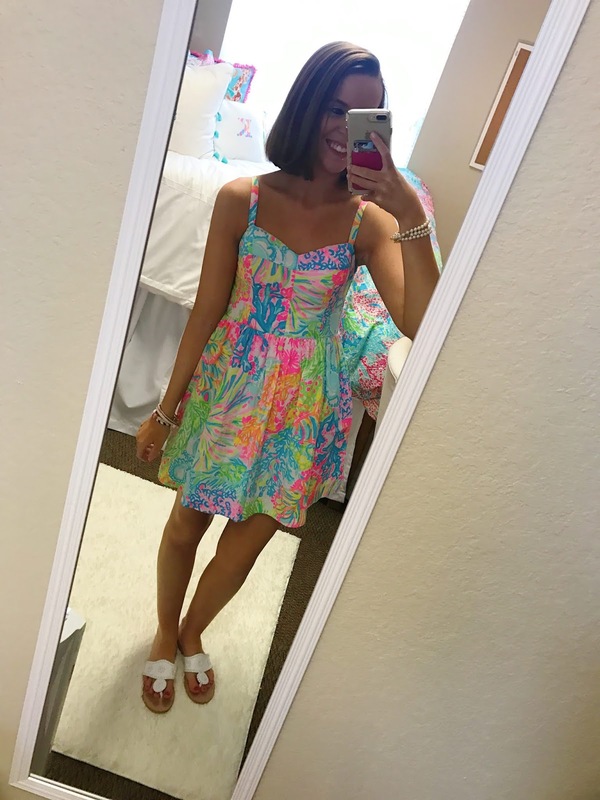 You'll notice most of my outfits are Lilly Pulitzer, many of which I have had for a few years. 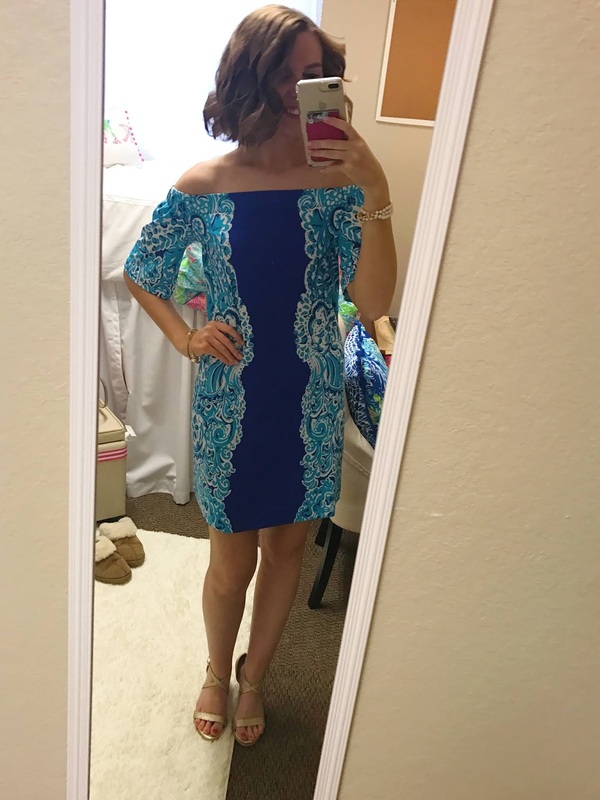 I wore these outfits because they are very me and outfits I would wear for events aside from recruitment. 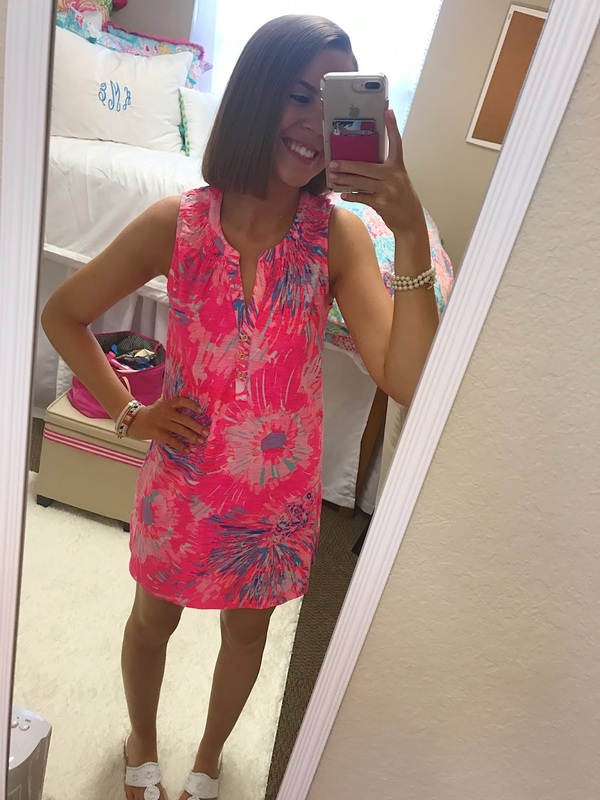 I felt comfortable, confident, and that I was dressing true to myself, which is my biggest piece of advice for dressing for recruitment. (Ok so I did offer a piece of advice, but I just mean if we would not be twinning all the time in real life, then you would not want to duplicate my specific outfits.) Pick outfits that fit your personal style, that you love, and feel comfortable and confident in!!! You will want to find a house where you can be you. At the University of Alabama, we have four different rounds, which I have outlined below. Each school is different, and depending on how many rounds your school has it may look nothing like Alabama's. Although the rounds and specific order may differ, the suggested attire I think is somewhat consistent across. 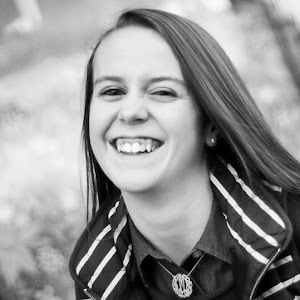 Definitely check your school's Panhellenic website to find specific information. I hope that this post helps put an image to suggested outfits! Also, I apologize these pictures are such poor quality. 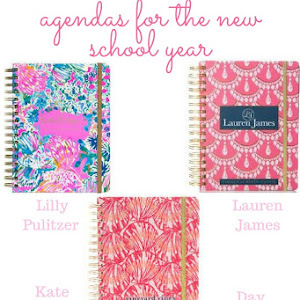 I took them in my dorm room with fluorescent lighting at about 7 a.m. each morning so they are not the best! 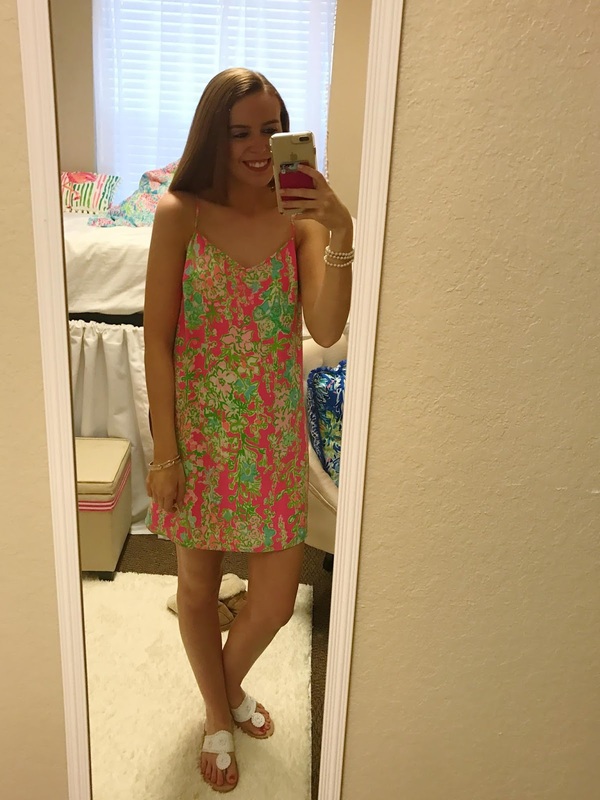 The first round at Alabama is called Ice Water Teas and UA Panhellenic described the suggested attire as "a sundress and flats or sandals," so that's what I wore. This round is two days, so the first day I wore a Lilly Pulitzer Essie Dress with white Jack Rogers and the second day I wore a Lilly Pulitzer fit and flare dress (style no longer sold) with the same Jacks. The second round is Philanthropy and UA Panhellenic provides shirts for Potential New Members (PNMs) to wear with shorts of their choice. This round also lasts two days. While I had picked shorts to go with each shirt, I decided to re-wear my shorts on the second day of this round because most of my parties had been scheduled for that day. 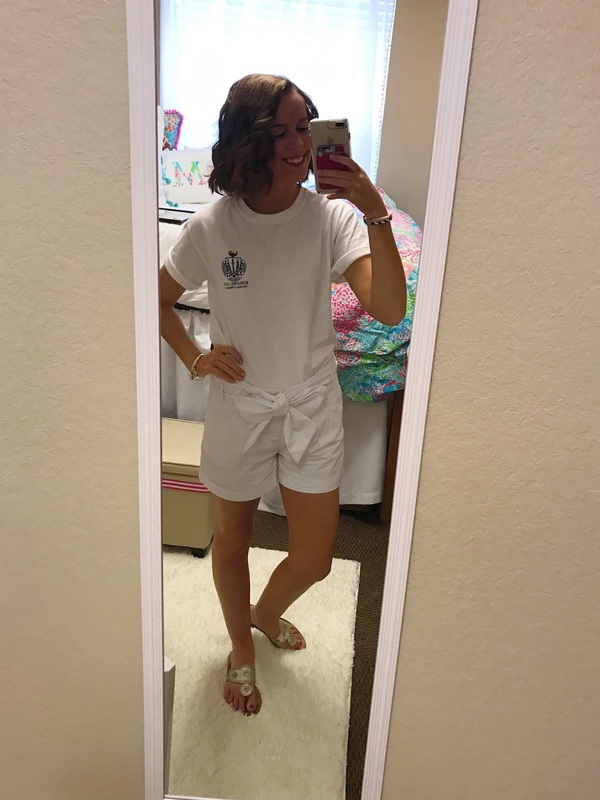 I liked these white shorts because of the bow, and since no active members in the houses would know I repeated the shorts, it didn't really matter. 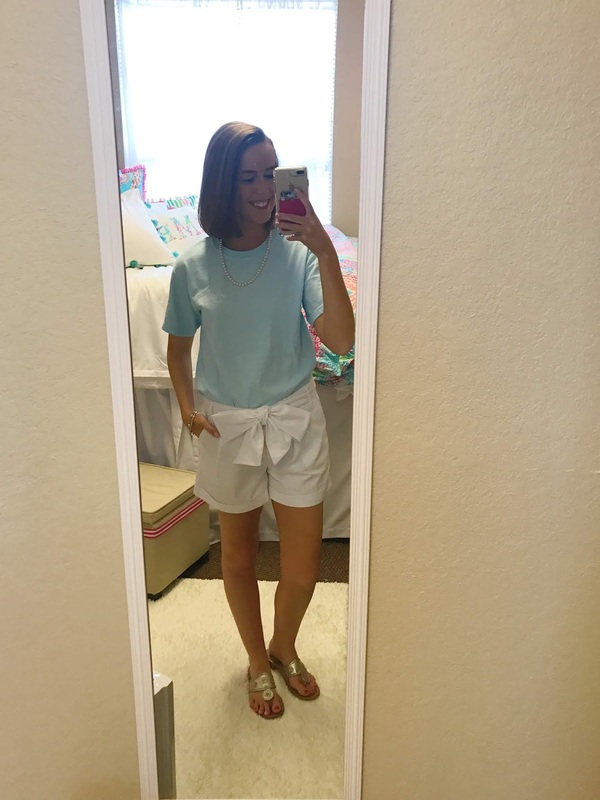 My shorts are the Linen Bow Shorts from Lauren James, but unfortunately they are no longer sold in white. One note I will make regarding philanthropy round: If Panhellenic suggests that you do not wear a skort/skirt, listen. I sat on a pillow on the floor at multiple houses, and wearing a skirt would've made the transition from standing to sitting on the ground rather challenging and potentially uncomfortable. The third round is Sisterhood and Panhellenic suggested "a nicer sundress with comfortable wedges, heels or flats." Again, this round is two days. I wore an off-the-shoulder Lilly Pulitzer dress (style is no longer sold) with Lilly wedges I found on a major sale. On the second day, I wore a Lilly strappy slip dress (style no longer sold) with Jack Rodgers wedges. I wore my Jacks sandals in between parties, hence why I am wearing those in the picture rather than the wedges. If you are going through recruitment this fall, best of luck and remember to be yourself!